Until recently, the only solution for people who had lost teeth was dentures. Though this treatment can still restore functionality and structure to the mouth, it’s not the only option anymore. Dental implants offer an additional treatment option for tooth loss that not only looks natural, but functions naturally, too. However, many patients stay away from this method because of all the misinformation surrounding it. 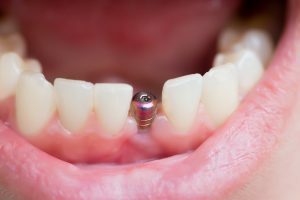 Learn the truth about these common dental implant myths and why they may be an excellent choice for you. A lot of the people who would benefit from dental implants tend to stay away from them because they believe the procedure will be painful. However, many patients who received dental implants stated that it was a lot simpler and less painful than they expected it to be. Once in your mouth, the implants will look and feel just like real teeth. Many also avoid dental implants because they think they will be expensive. 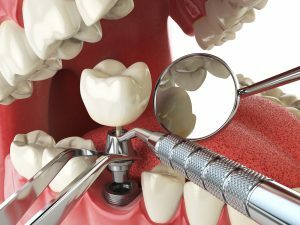 When you are weighing the costs of dental implants, however, you should consider the long-term expenses. Implants are actually less costly than bridges in the long-term because they last longer. Bridges need to be replaced every seven to 15 years, whereas implants last a lifetime. This makes them more valuable overall. Dental implants are nearly indistinguishable from regular teeth. In most cases, the only people who will be able to tell the difference are you and your dentist. Your secret is safe with the family dental care in Tyrone, GA.
Implants require no more maintenance than any other teeth. You can still eat and drink what you want. The only care they need is daily brushing and flossing, as well as regular trips to your dentist. There are no special precautions you must take with the dental implants to ensure they last a lifetime. This dental implant myth is half true. Any dentist can obtain a valid license to place an implant, but they must have the training necessary to perform surgeries. So, any dentist has the opportunity to learn how to put in implants, but not all of them have the knowledge and licensing to do so. Working with a properly trained dentist ensures that your procedure will be a success. The length of recovery can vary from patient to patient and can last anywhere from two to six months. The long recovery time is necessary, so the dental implant root has ample time to bond with the bone. Though it may take a while, most patients feel it is worth it to get their beautiful smile back.